Stibnite is a sulfide mineral found in low temperature hydrothermal veins and hot springs deposits. It is prized by collectors for the long slender bladed crystals. These can occur in clumps with many orthorhombic crystals radiating in all directions. It is very soft only a 2 on the Mohs hardness scale. The bladed crystals can be gently curving due to the effect of twinning. 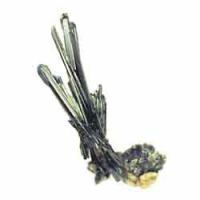 Stibnite is found associated with quartz, calcite, gold, and other sulfide minerals. Significant deposits are found in China, Japan, Germany, South Africa, Brazil, and Peru. It is also found in the U.S. in Arkansas, Idaho, Nevada, California, and Alaska. Also known as antimonite, stibnite is the primary source of antimony which is used to harden metals and to reduce friction. Location: China; Japan; Germany; Brazil; Peru and South Africa. . In the U.S. it is found in Arkansas, Idaho, Nevada, California, and Alaska.